Srinivas Gokulnath and Amit Samarth have completed the Race Across America (RAAM). They are the first Indians to finish within the official cut-off time in the solo category. According to reports, Srinivas completed the race in 11 days and 18 hours while Amit took 11 days and 21 hours. Solo cyclists have to finish the race within 12 days. The third Indian participant in the solo category, Samim Rizvi, unfortunately ended up Did Not Finish (DNF). In the team category at the 2017 RAAM, one of the entrants was Sahyadri Cyclists. 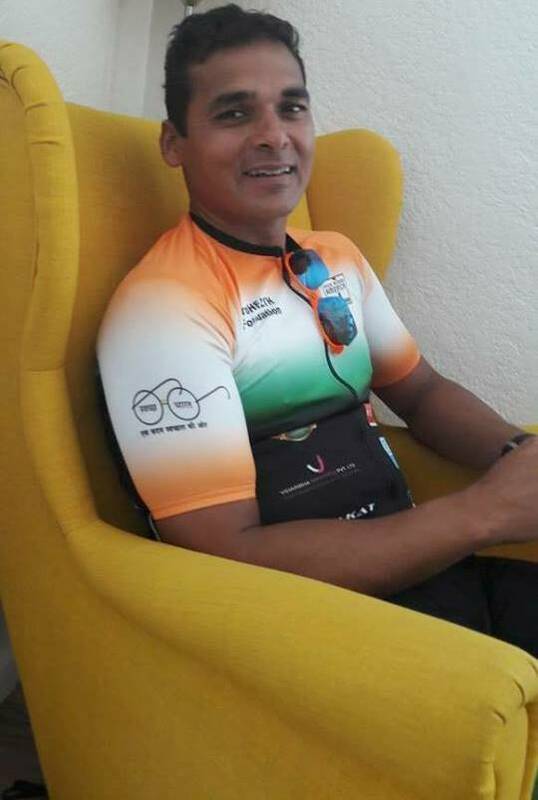 While the cyclists were four – Rajendra Nehete, Ramakant Patil, Sandeep Shewale and Pankaj Marlesha, the support crew included the Mahajan brothers with Hitendra Mahajan listed as crew chief. At the time of writing this article, they were past 3036.1 miles. Also continuing in the race was Andre Kajlich, the first handcyclist to qualify for the solo category in RAAM. He had covered 3021.9 miles. RAAM is among the most punishing endurance races out there not just in cycling but across sports. Unlike the more popular Tour De France, RAAM does not feature daily stages. It proceeds at one go with the overall cut-off time, differences in terrain (the total climbing at RAAM aggregates to 170,000 ft), variations in weather and distance – a ride right across the United States – making it terribly challenging. Aside from riders managing their need for rest, there are no assigned rest days in this race. Simply put, RAAM is 30 per cent longer than Tour De France and has to be finished in roughly half the number of days (that said, Tour De France is a more intensely competitive athletic experience despite the lesser number of hours cycled every day. A reader of this blog pointed out, “ the athletic demands of a 3 week-Grand Tour are far greater, and intense, than those of RAAM, which whilst extremely tough is much more of a consistent effort dependent on managing one’s endurance resources.” There is thus, disparity in the physical demands of the two events making comparison difficult and potentially misleading). DNFs are common; even reputed cyclists including those with considerable experience at RAAM, succumb to it. This year one of those who had to DNF was 57 year-old Seana Hogan, among the most successful RAAM champions in history with six wins in the women’s category. She won it in 1992, 1993, 1994, 1995, 1997 and 1998 with timings that were at times better than what was registered by many in the men’s category. Her 1995 record of 9 days 4 hours and 2 minutes remains still the fastest solo finish among women. A RAAM legend, 2017 was Seana’s eleventh attempt. This year, the winner in the solo category for women was Sarah Cooper of the US. The fatigue caused by near non-stop cycling could be felt by those remotely tracking RAAM via Internet. While the 1000 mile-mark was quickly reached by the leading group of cyclists – including Amit and Srinivas, the passage from 1000 miles to 2000 miles and beyond, seemed to take ages. An exception was Christoph Strasser who won the race this year. His progress was almost steady (for the update posted at the time Strasser crossed the finish line, please click on this link: https://shyamgopan.wordpress.com/2017/06/22/raam-christoph-strasser-wins-again-amit-and-srinivas-are-past-the-2250-mile-mark/). When San Diego based engineer, G. Rajeev met Amit Samarth at the start of the 2017 RAAM as part of contributing a spot report for this blog, Amit had told him that he had previously crewed for Siena Hogan. In tough endurance races like RAAM, the support crew matters as much as athlete. A post on RAAM’s Facebook page said that Amit’s crew for 2017 appeared a family affair. The crew included his mother and wife; his seven year old-son was also along for the trip in the support vehicle, the post said. Besides being a cyclist, Amit is also a triathlete; in December 2016 it was reported that he had completed a full Ironman in Australia. For Srinivas Gokulnath, 2017 was his second shot at RAAM. 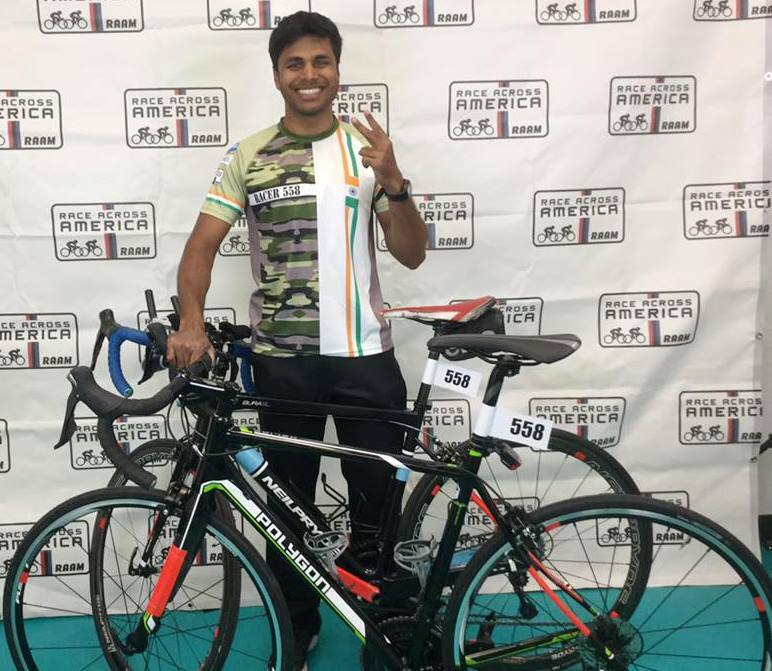 According to a 2016 news report ahead of his participation in the 2016 RAAM, Srinivas is a senior medical officer serving at the army’s artillery center in Nashik. A specialist in aerospace medicine, the Lt Colonel had earned a place in the Limca Book of Records by cycling from Leh to Kanyakumari in 15 days and 22 hours in 2014. His hometown is Bengaluru. In 2016, he gave up his attempt at that year’s RAAM at Oxford, Ohio after cycling 2460 miles (3959 km) in 11 days. As per information available on the Internet, his support crew for 2017 was headed by Chris O’Keefe (he completed RAAM, second in his category in 2016). Others in the crew included Srinivas’s wife Prafulla, his coach Alberto Blanco and Venkatesh Shivarama of the Bengaluru based-Wheelsports (for an earlier article featuring among others, Venkatesh, please try this link: https://shyamgopan.wordpress.com/2013/08/24/cyclings-second-youth/). A video featuring O’Keefe, on RAAM’s Facebook page, mentioned that Srinivas faced problems on day two of the race but had since clawed his way out of it. Christoph Strasser, who won RAAM this year, is one of the best known cyclists associated with this event. He has won RAAM thrice before and holds the record for the fastest time – 7 days, 15 hours and 56 minutes. Away from RAAM, according to Wikipedia, he also holds the record for the maximum distance cycled on a road bike in 24 hours – 556.856 miles (896.173 km). UPDATE: Team Sahyadri Cyclists has completed the race. They finished in 8 days, 10 hours and 16 minutes. At the time of writing this update, Andre Kajlich had covered 3106.9 miles.